Multi-instrumentalists, Line6 must have you in mind. The equipment maker, known primarily for their guitar products, has plunked a keyboard on their multi-effects box / audio interface hybrid, TonePort. There are plenty of reasons to like the TonePort line: a broad approach to effects that caters to vocalists as well as guitarists, and cheaply-priced but good-sounding effects, in an interface with excellent low-latency performance. (Not to mention retro-looking VU meters, and they’re not just eye candy — they’re assignable.) Not everyone will need a keyboard in the same unit, but if you do, it’s nice to see a real mod wheel, an always-on octave LED (as opposed to most keyboards, which require us to guess which octave we left them in), and handy knobs, transport controls, and foot pedal integration. Deep software integration and a dedicated headphone port could make these a nice addition to a laptop rig. My own personal preference would be for a standalone unit to go with another keyboard, but I know some friends I’m sure will want one of these. 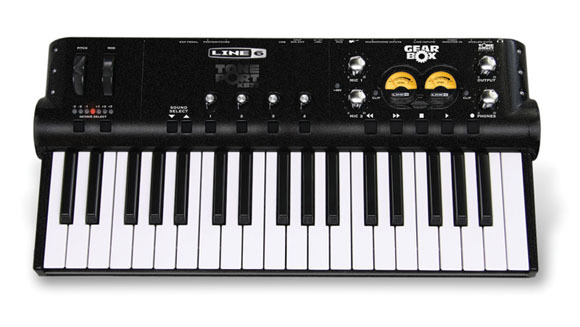 The only major question mark is how good Line6’s keyboard quality is; stay tuned for that and pricing. Updated: Music thing’s readers have something interesting to note on the keyboard issue: Marcus Ryle, a vet of Oberheim who worked on the classic Xpander and Matrix 12 synths as well as a keyboardist on “We are the World” works on product development. So, did Line6’s keyboard love finally rub off on a product? That sounds good to me. I hope Line6 doesn’t stop there, though. What I love about the KB37 is that, at the very least, it’s a new concept that challenges some assumptions about different markets. A quick stroll through any NAMM show will show you this is a very conservative industry, with pretty rigid ideas of who its customers are, and usually that includes accepted dogma like “guitarists won’t touch a keyboard.” They have a lot of business experience making those markets work, of course, but I’ll bet if you’re reading this, you and the people you know don’t always fit into those categories.